In a scientific detective story with Halloween overtones, researchers say they have definitively identified what causes white-nose syndrome in bats: a fungus. 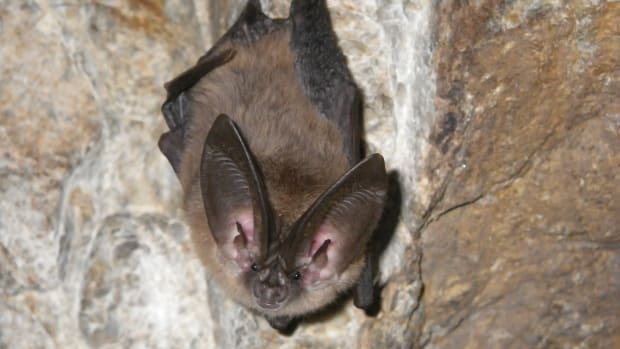 The journal Nature today reports that exposure to the fungus Geomyces destructans resulted in white-nose 100 percent of the time among an experimental colony of hibernating little brown bats. The disease is named for the fuzzy white material that grows on the bats&apos; muzzles while they hibernate over the winter in caves. Miller-McCune has been following the explosion of white-nose since 2008, when David Richardson wrote about a new and mysterious malady that had catastrophic consequences for bat colonies in the Northeastern United States. Since then, the disease has spread dramatically to 16 U.S. states and four Canadian provinces, exterminating up to 80 percent of the bats in the most impacted areas. Beyond feeling bad for bats, the animals are credited with saving farmers billions of dollars by eating bugs that would otherwise eat their crops. Even at the dawn of the threat, scientists such as David Blehert, head of diagnostic microbiology at the USGS&apos; National Wildlife Health Center, had a strong hunch that this particular fungus was the culprit. The fungus was found on bats with white-nose, but researchers couldn&apos;t be sure if it caused the disease or was a symptom. Their efforts to confirm or deny this suspect&apos;s culpability created an excellent opportunity to watch science in action. One confusing clue arose when the fungus was found on bats in Europe — and those critters were healthy. The paper released today speculates that Europe&apos;s bats have adapted to the fungus, which researchers know has been there for at least three decades, while its arrival on U.S. shores presented it with a "naive population of animals" ripe for devastation. Now, with assurance that the fungus is the cause of the malady, officials can better craft techniques for saving the bats. And for more on what the National Wildlife Health Center does, see Madeline Bodin&apos;s Miller-McCune cover story from this summer here.